My trip back to Texas from my summer in Idaho was a hurried affair. Usually I plan on arriving for my winter rounds with family just in time for Thanksgiving But a grandson’s wedding, which takes place tonight, moved that up by about six weeks. Even so, I managed to knock two things off my to-do list, now more popularly called a bucket list, on my way back to my native Lone Star State. 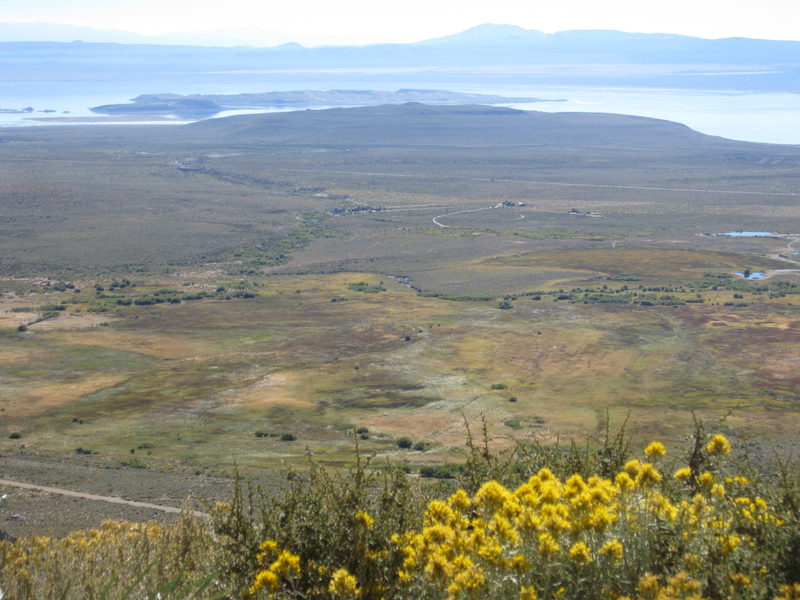 Mono Lake and Yosemite National Park now have check marks beside them. . It may be easier for some of you to understand why Yosemite was a place I wanted to visit than it is to understand why Mono Lake was on my list. After all, it’s simply a shallow, very salty, often smelly lake As we neared the lake basin, My canine traveling companion, Maggie, perked up at the smell, wrinkling her nose a bit as she caught the scent. . I’m not sure what she was thinking. The odorous shoreline, however, reminded me of Great Salt Lake, a place whose beauty I came to greatly appreciate while living next door to it for 25 years. The Utah lake is larger and much younger than the smaller and much older California lake. Both, however, are part of the Western Hemisphere Shorebird Reserve Network that provides habitat for millions of migratory birds. About the only species I saw on Mono Lake, however, was the California gull, which incidentally happens to be Utah’s state bird. It was given the honor after Mormon settlers in the Salt Lave Valley credited the gulls with saving their crops from a cricket infestation. Neither lake has an outlet, and so remain the depository for everything that flows into them. Their importance to the ecosystem, however, has in recent years led to conservation practices engineered for their protection. 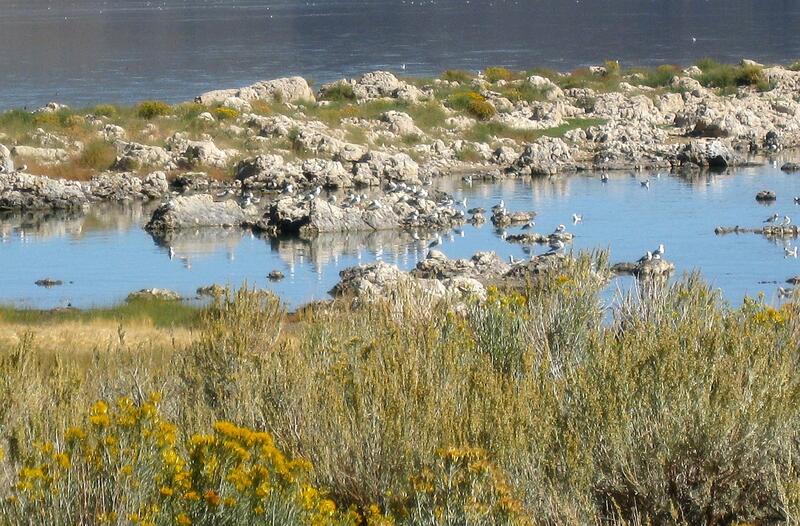 Our #2 daughter was a summer intern at Mono Lake for several years back when she was in college. I never got out there, but I love it from her pictures. I’d love to go sometime. The tufa sounds like something I would never tire of inspecting! Great pics! Never heard of this place so you have expanded my horizons as well! Thanks. Glad your horizons are expanded. I love it when that happens to me, and I’m especially grateful when it happens on a daily basis. Learning something new is what keeps us young, well at least our brains if not our bodies. Pat, do you think Mark Twain saw a different perspective or perhaps his feelings were just different and didn’t appreciate the beauty you saw? I don’t think Twain was connected to the landscape the same way I am, and certainly back in his time the lake, which is too salty for fish, was probably seen as having no purpose. Today, SOME of us know better. I once quoted former Utah congressman, Jim Hansen, while writing a newspaper story on public lands vs. private lands, saying nobody would miss Great Basin National Park in Nevada if it were done away with. OUCH! Great Basin National Park contains 5,000 year old bristle cone pine trees. I should have later thanked him for his comment, however, because my editor sent me to the park to write a story on why it was valuable, and I got to walk among these trees. Some of the loneliest places in the world declare their beauty by the silent act of existing. In the way the world creates life in all environments. I never cease to be humbled by the life that is all around us.